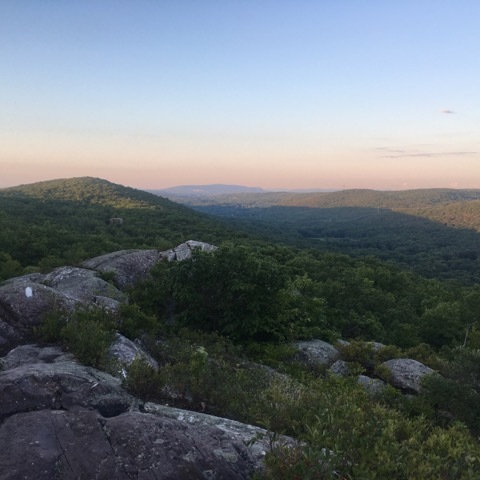 We got back out on the trail this past Friday night for our previously postponed overnight here in New York and did the last 8.8 miles of section 12. 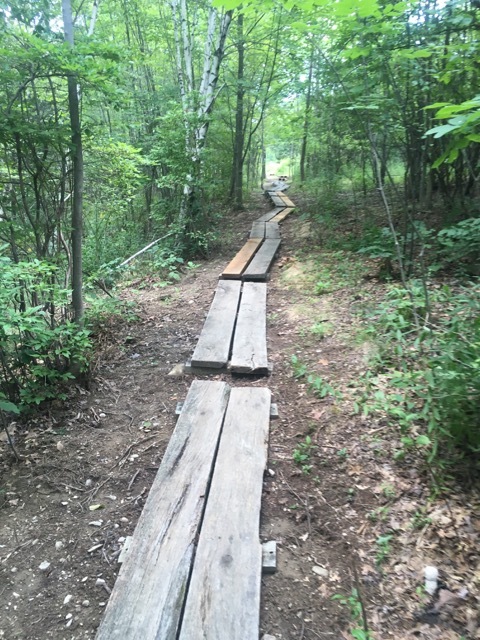 Now that this section is complete, that leaves only one 5.9 mile section (section 13) until we’ve finished all 90 miles of the trail in the state! Though we also are going to use the steep 1-mile state-line trail to get up to the border crossing and start that last section north. That’s going to be quite a dramatic one, both for the climbs, and the views. We can’t wait. Thank god for rebar, I think. 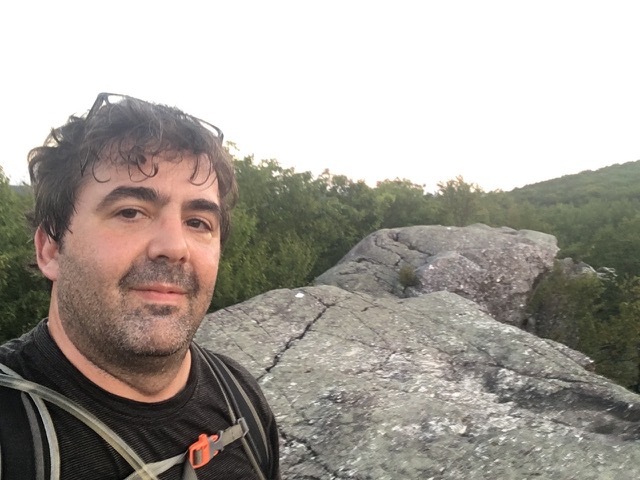 This past weekend’s hike, especially the last 1.7 miles, was a mix between very easy walks through the woods, and challenging ascents up and down rocky cliffs and boulder piles. We did the northern 3.6 miles of it three weeks ago and were only hoping we could get 4 more miles of it done for a quick overnight this time. But as we were arriving later than planned, things actually worked to our advantage in many ways. As we were sitting in the last of several rounds of Friday evening rush hour traffic, Fielden Stream suggested a change: to do it northbound. We’ve done all of N.Y. southbound, and I can be pretty O.C.D. and stubborn once I’ve spent a lot of time researching and planning a section. So last minute changes usually unsettle me, and this one did too. But I also found her logic sound, and also found the silver lining which was that if we could get a ride from farther out, we could put in more miles than planned the next day, and maybe even finish the whole section. And that we could potentially experience some beautiful sunsets on our hike and still make it to the shelter by nightfall. The elevation profile, except for the features known as the Eastern Pinnacles and Cat Rock, was mostly level. And both of those, should it already be dark at our arrival there, had side routes around them to avoid them if necessary. I of course really, really wanted to see them up close, especially at sunset. So I was feeling a little stressed about covering the two miles and seeing them both in less than an hour before nightfall. But the original plan also meant getting a taxi to meet us at a pickup spot we didn’t really know well and then getting a ride up to the north end to hike south. 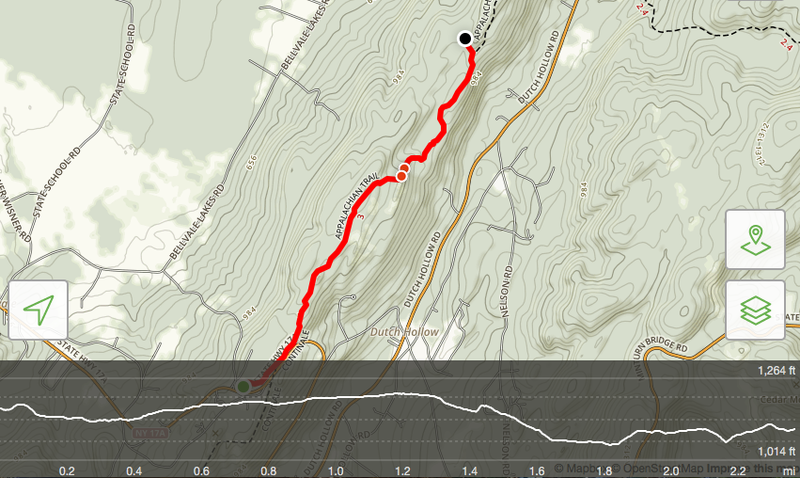 We’d likely be climbing a 500ft ascent in less than half a mile in the dark if we stuck to the original plan. We did call the cab company and confirm with them that they could do that, but it just made us nervous as we’d never used them before, and the other cab company I called on the drive down basically hung up on me when I called, giving me more anxiety about using a cab. As always, I referenced several printed and online sources about overnight parking on the road crossings along this hike, but I found the information contradictory from one source to another in this particular area. The last thing I want is to hike back to a car that is no longer there. They really need to either get all these sources to be consistent somehow, or the towns should post signage at the road crossing that is clear if you can park there or not. The lack of those signs, while encouraging, is not any clearer, and also brings about its own anxiety fest. I’d probably care less if I wasn’t needing to be back at a specific time, and already pushing to go a much farther distance. We were already cutting it close if anything went wrong. My mind was juggling the options frantically as we approached the trail crossing on 17a. It turns out the cab company we used were fantastic, though. 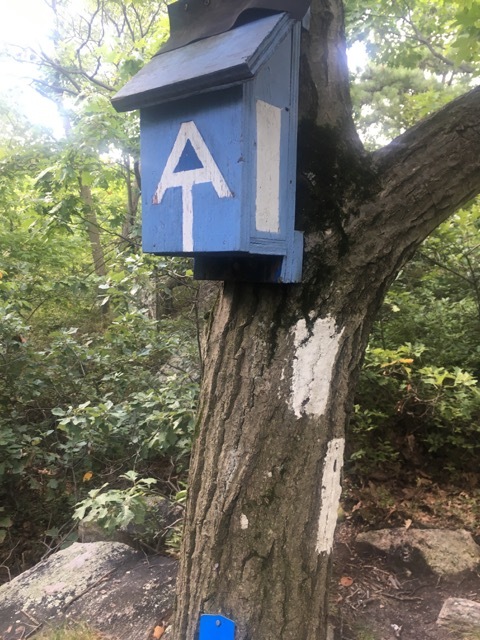 And I want to thank Lori and Night Owl taxi for the excellent service, and Ken on the Appalachian Trail Section hikers Facebook page for recommending them when he wasn’t able to shuttle us himself. Next question. Where should we park on 17a? I did know where you could officially park in one lot, and that was the plan. But there’s not an endless number of parking spots. 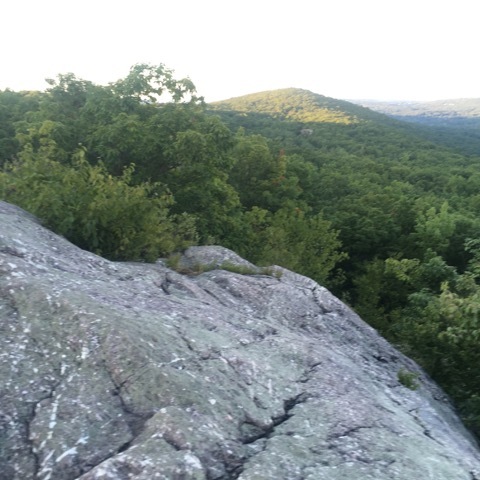 And it was a Friday night on the first non-oppressively-hot weekend in a month, and a very popular section to hike. So you need to have a plan B, and so I had already researched other parking options in the area. Another person on the Facebook forum said we could overnight park at the upper lot at the Bellvale creamery, which is used for the hawk-watching platform. We decided to park there because we thought it would save us some time. And we figured by using the .2 mile side trail to the A.T, it would also take a little distance off our hike and hence a few minutes less worrying about remaining light. We have not night-hiked yet and while we were ready to try it if we needed to, I still really wanted to do the rock scrambles to the views. There were lots of ‘no parking, private property’ signs on the road leading up to the upper lot, but when we got up there, there were none. We figured it must be okay, and the advice of a local is as good as any we’d gotten. But to be honest, I was still all nerves about that and almost made us drive down to the other lot after our packs were already on, since there were actually some spots there that we saw after all. But I let it go and we buckled in and headed up the access trail. I’d love to check out the hawk watch, but we can do that when we finish here. We didn’t have any time to spare. Just as I was getting relaxed because I was on the trail, I realized the quarter-mile side trail was taking us back south to the A.T. almost where it crossed the road by the other lot! So essentially we just added this distance to the hike we had less than an hour to do! It wasn’t until we reached the bottom of the climb up Eastern Pinnacles that my anxiety finally drifted away and I was in adventure mode; though I created plenty of anxiety in the process for Fielden Stream. We made quick time of the first easy mile before reaching them. 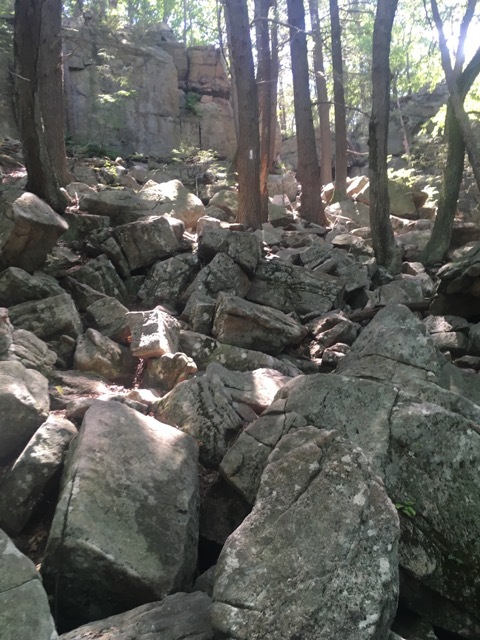 As soon as I saw the rocky climb I knew it would be something awesome and also a little challenging. But I’ve had so many great opportunities this year to push my comfort limits that I literally ran up it without pause. It felt great. My trail runners also needed a real traction test and they didn’t let me down. I took in the long view to Cat Rock and the mountains and valleys beyond as the sun set over them. Fielden began to follow me up the rock outcropping. I got myself so giddy with my new spidey-senses that as soon as I saw a few women hiking our way, I asked them to take a picture of us on the rocky ledge with the beautiful sunset and ventured a bit down the ledge. This was of course completely insensitive to my wife who was not ready for a picture, or a conversation with strangers while negotiating the climb. Mind you, she climbed them like the best of em, but I embarrassed her. 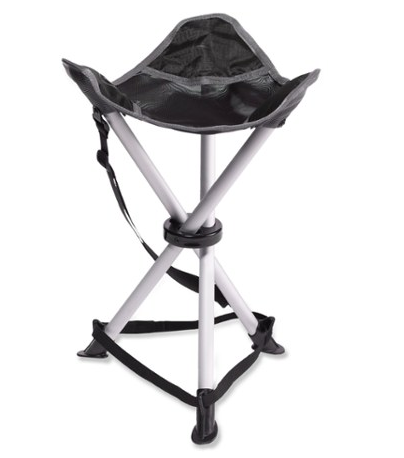 REI Trail Stool: Only 1lb and $23! They offered repeatedly to do the photo but we declined and I tried to undo my stupidity and went back to help her get the poles in her pack, on top of the ledge. For a second I wasn’t sure I’d be able to balance correctly up there to do it, but I was still maneuvering beyond my own expectations, and it was a breeze. I thank my trail runners as much as Mt. Race. The women moved down the trail and we stopped to take in the view before also heading down along the rocky spine of the pinnacles. It was like a balance beam for a while, but fun. We headed back into the woods and made our way to Cat Rock, which is just before the shelter. This formation is a bit different. While it requires a similar climb to the pinnacles, it’s almost completely flat on top, and the western edge drops sheer down into a ravine and the top jutts out over the cliff, almost like a mini mcafee knob. I was also glad here that we went northbound, as the climb down was a bit trickier, and would have been tougher going up. I took in more sunset views and as many photos as I could, though I kinda wish I took one from farther as it would have been more dramatic if I were standing on the edge! Fielden stream waited for me to catch up and as we got back into the woods, night was beginning to set in. We had only one or two tenths of a mile to the shelter. We passed one brook which was little more than a puddle, and then saw the sign to the campsite area. Some hiker had dropped used tissues or toilet paper along the last half mile or so of trail. Perhaps a kid? Yes this stuff is biodegradable but its reprehensible that someone would just drop these every quarter mile and if it was a child that the parent didn’t care enough to help them pack it out. It really marred the experience and the trail for us here. We quickly found a flattish spot to set up our tent. There were a few southbound and a few weekend hikers already set up. Some of them had set up their tents in the shelter, which I think is incredibly obnoxious and entitled. Furthermore, when I was asking them where the bear box and privy were, they wouldn’t even get out of their tent they had set up in the shelter to show me, and got irritated with me when I couldn’t understand where they were saying they were because I couldn’t see them inside their tents and it was getting dark fast. This is not how we share a campsite with others. Just because you were there first, and you’re doing a long distance hike, does not entitle you to act this way. Their two tents took up the entire shelter. While no one else had trouble finding a camping spot, shelters are for those who don’t carry a tent, and to protect people in bad weather. This entitled behavior is what gives some thrus a bad reputation. Thanks for catching the flies chasing me! Anyway, we went about making dinner, our first time with ‘Good to Go’ brand. We did the Thai curry which could be considered a questionable decision when sharing a tent! They are also around $11.50 each so certainly the meal of short section or weekend backpackers not on a long term budget. 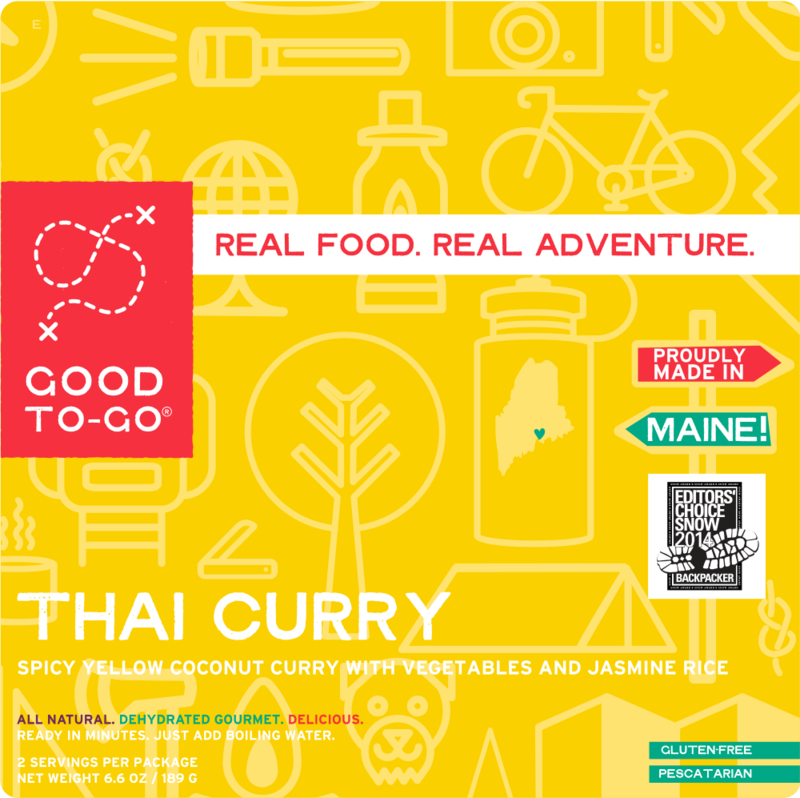 But they are reviewed as one of the best dehydrated backpacking meals out there (including a Backpacker Magazine Editor’s choice award), and particularly this recipe. It was tasty, even if it took 20 minutes to cook. I brought along the camp stool again, which I love and hogged the whole night. The 1lb weight is totally worth it, especially for a weekender like me. After a nice dinner where the bugs enjoyed eating us as much as we enjoyed eating the curry, I managed to find the bear box and get our food put away despite the lack of the hook, and the mcgyvered closure method with the piece of chain that was left. I sent a few pictures to our family and we got ready for bed. I had decided recently to use my smaller, lighter usb charger to re-charge my phone overnight, and knew that last time I used it it still had about 50% charge. I didn’t check it or re-charge it. Big mistake. It was dead. 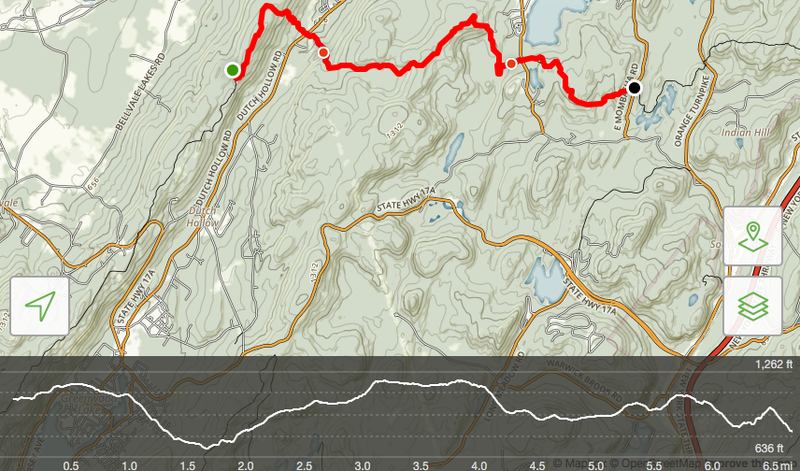 I use an app to check topo changes and that we’re on trail whenever blazing gets iffy. So I was super annoyed. Next time, I’ll just bring my heavier Anker. It still has its charge 2 months later. Clearly this goal zero lipstick style one doesn’t hold a charge long. I shut off the phone to preserve battery until morning. We slept just with light cover as it was warm still, though cool enough to be comfortable now that the heatwave broke. The full moon woke me in the middle of the night shining down from the sky. The next morning I found the small campsite brook and collected some water for our coffee and grits. The privy was absolutely disgusting and left a lot to be desired. Trash was everwhere inside, and spiders the size of baseballs lined the walls and hung from webs above. There was an interesting bird call we heard which I think was a whipporwill. We did meet one nice northbound thru and had some conversations with him. 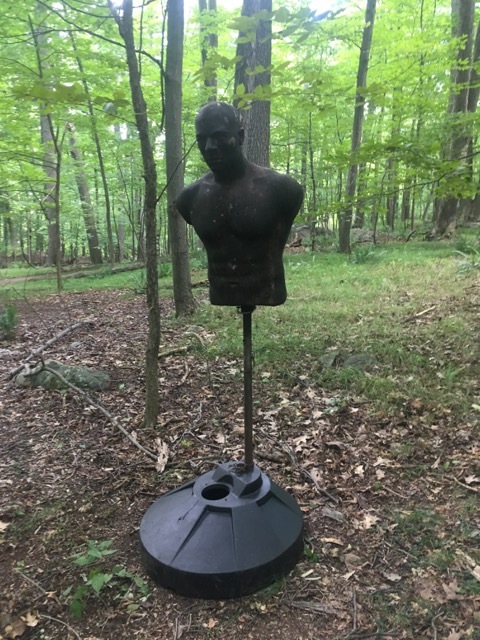 I gave him some info on the Connecticut spots (and privies!) he might enjoy best. He didn’t seem to have any issue with this disgusting privy but I was proud to tell him how nice our new moldering open-air privies are! I signed the register after breakfast and we headed up to the trail in a hurry, but letting our new friend go first as we were obviously going to be slower than someone who just did over 1,000 miles. If we could manage it, I really wanted to get the 6.7 miles to where we left off covered. And we were to discuss this as we reached the bottom of this mountain at the first road crossing 1.5 miles north. If we didn’t we’d still have 1.7 miles left of the section and we’d have to do that either on a separate trip, which seemed foolish, or when we were back in October to finish to the NJ line. 1.7 miles… easy, right? Not this 1.7! 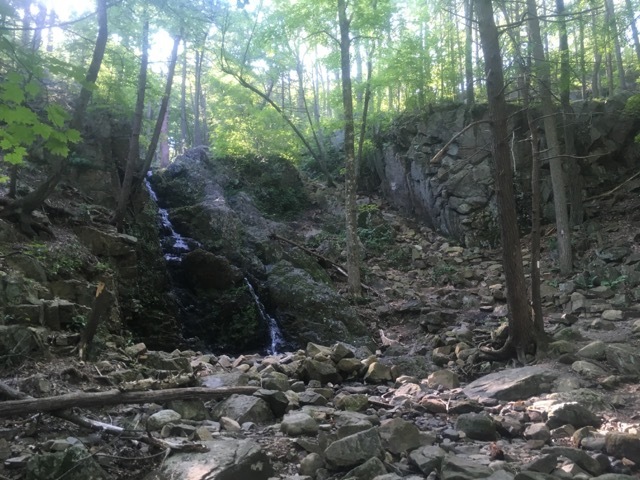 We crossed the road and since I thought the beautiful Fitzgerald falls were just into the woods on the other side, I suggested we discuss the plan by the falls… Well the falls were about half a mile into the woods on the next 3.5 mile stretch to the next road. At this point, if we didn’t want to risk not having a ride further out it was go back half mile or go forward 3. So we did the latter. But first we called the taxi company again to check how far they’d go and they had said they could come get us at either road crossing. So we gave them a time frame and they said to call when we were about 30 minutes out. Feeling good to have lined up a ride back, we continued on. The falls were beautiful and the trail conference had built brand new steps up along it to replace what was left of the original ones. The falls weren’t raging by any means but they had a decent flow and were very lovely. The stairs were steep but easy, and we passed the second southbounder of the day on the way up. The ascent up to Mombasha High point continued, though because we were going northbound, this ascent and the next (we thought) would be gentler. It was still pretty steep, though before the summit there was a long stretch along a shoulder of the mountain that was nearly flat and was like walking an old woods road. The mushrooms were everywhere here and we enjoyed listening to more bird calls and trying to identify them. There was one more short ascent before we reached this mountain’s ridgeline and the intersection with the Highlands trail. 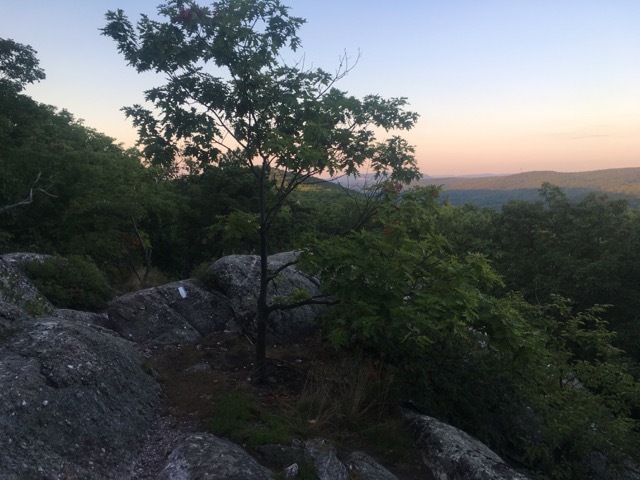 That trail takes you 5 miles south along the Sterling ridge to the Sterling Fire tower, which we hiked to in October of 2013 when on a trip to Warwick for Fielden’s sister’s birthday. This is the ridge on the opposite side of Greenwood lake that the A.T. is on. From here we walked the ridgeline for around a mile and enjoyed the breezes, and a snack before the descent. There was a nice little view up there, at about 1,280ft. We passed another southbounder who had confirmed there was a view or two, and gladly he was right. We would meet him again later. The trail descended steeply and then followed a series of boardwalks to West Mombasha road. This is where we would likely stop for the day. Except you know I didn’t want to do that! Here we had the discussion about the last 1.7 miles. We sat down in the shade on the boardwalk and I did my best convincing that this is only 1.7 miles and we had just done 5 in less than 3 hours, and still had an hour and a half to do this last bit. It couldn’t be that hard! And then we would be able to finish the state on one last glorious hike this season! We already had a ride guaranteed from either road, so that cinched it. We crossed the road and met another southbounder who was having a snack and filling up on water from the cache of water jugs left there. We asked what the last bit was like and she said the first part was easier and the second part a bit bumpier. The guy we met on the top of Mombasha high point had also told us it was a bunch of little 500ft ups and downs. The profile didn’t show anything that severe, or so we thought. Or we would maybe have waited on it. 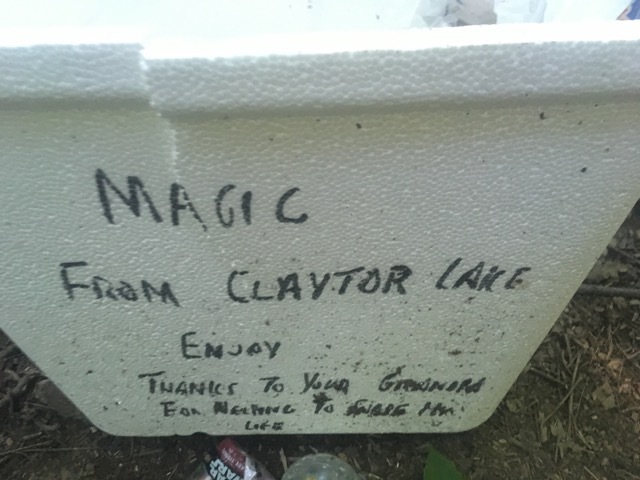 Her description wasn’t that intimidating either, and she told us there was another supply of trail magic water at the other end. Off we went. I was happy. Just before we climbed the first of the ‘three spikes’ in the profile, I noticed several other wide trails here, and a bizarre human ‘target practice’ dummy. It was creepy. I’m assuming someone does some sketchy things here. I picked up the pace and as I rounded the corner, found myself at the bottom of a large rock pile. Here I thought, boy is she going to be pissed! Beyond this boulder pile with the white blazes through it was a cliff ledge. I had done these in Harriman last summer and Fielden certainly has done stuff like this. I had no doubt she could. But I was going to be in trouble for saying this would be a quick easy section. She was annoyed with me, but it was easier than it looked. There were easy paths through the rocks, and it really wasn’t steep except for the last 10 feet which you could pull yourself up easily. I waited for her at the top while she put away her poles and followed me up. I then moved ahead a bit and followed some ledges to a nice break point where there was a plaque commemorating an Austrian man who was a trail volunteer here for many years and when he died they had spread his ashes here. FIelden stream met with me here and we enjoyed the ridge walk and the views of Little Dam Lake from the ledges. We were glad we were finally at the top of that and surely the final bump couldn’t be any worse. 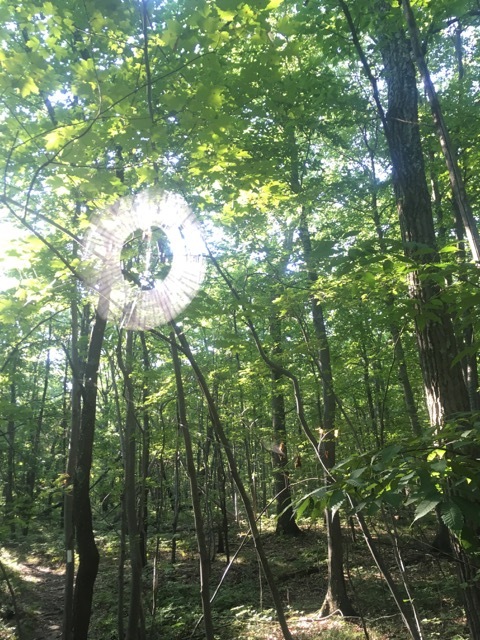 We had a steep but manageable descent into a hemlock grove and as I was a bit ahead, I let her know with a call when I saw it ahead. Another boulder pile and cliff. Only twice as steep, and with no end in sight. As I put my poles in my pack, the phone started lighting up with texts and a voicemail from the cab, saying she was in the area, and happy to wait for us a bit if we still needed the ride. 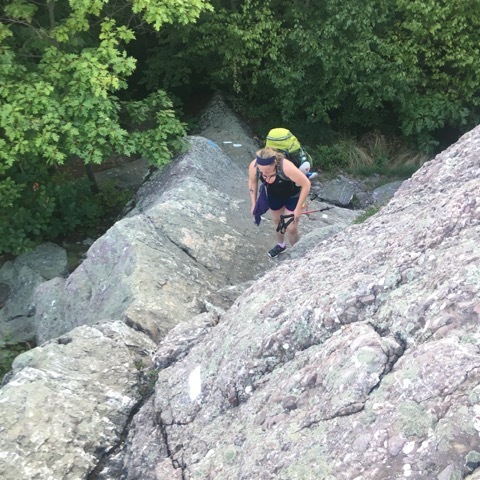 I texted her back and left a voicemail saying thanks so much for reaching out to check in and we’d hopefully make it there by 1-130, as the last climb ahead was going to be a doozy. At least a little prepared by my warning, when Fielden arrived at the bottom I helped her pack in her poles and we just set about the business of climbing the monster called Mount Buchanan. It started with the same negotiating of boulders. But these were much bigger, with not really any room between them, and fallen trees in between to make it a bit more difficult. Though one tree did have a path cut through it. Thanks, volunteers. It then got immediately steeper and more difficult. As I pulled myself up a large rock and negotiated around its backside, I saw ahead that there was another twist to the right through a crack in the cliff face. As I approached that and balanced myself on a sloped rock along the cliff, I found a root to pull myself safely to the next turn. At this turn, the trail climbed again up a large pile of boulders with a few roots from a nearby tree to grab onto and hoist up. The steepness and the twists did not subside here. Fielden was below me and trying to talk herself through it to me. I totally understand that method, but I was feeling like I was in survival mode and was not talking back. Everything I had in me was used for concentrating on footholds and grabbing roots and rocks that could support the weight of myself and my pack. I made it to the ledge here and just pushed ahead. As I followed that ledge a bit I looked up and again the trail climbed steeply over more jumbled rocks and roots to a higher ledge. I grunted and bitched and looked down only once to know that looking down wasn’t a good idea. But what I thought was the end was ahead. I’m pretty sure I said ‘this ain’t hikin’ anymore folks!’ or something to that effect. I knew a fall here could be a serious or fatal one. At last I pulled myself up the last bit of it and shouted down to my wife “ are you still alive” which she thankfully answered yes to! We made it to the top, dripping buckets of sweat and thanking the lord above we had no falls on that. And glad we didn’t have to go down it, which we would have had we gone southbound. My balance and gravity are far worse on downhill ledges. Our guts and our trail runners got us through in one piece. We then wondered why in the hell there is no name for this little feature. In the guide, it’s described as a ‘very steep tumble of rocks.’ While that might be accurate, we dubbed it ‘the cliffs of insanity’ in tribute to the Princess Bride. How Agony Grind and St. John’s Ledges can have a name that illicit fear, but this one doesn’t is beyond me. Combine those two and you’ve got this one. And never during those did I feel in real danger. I like our name for it. 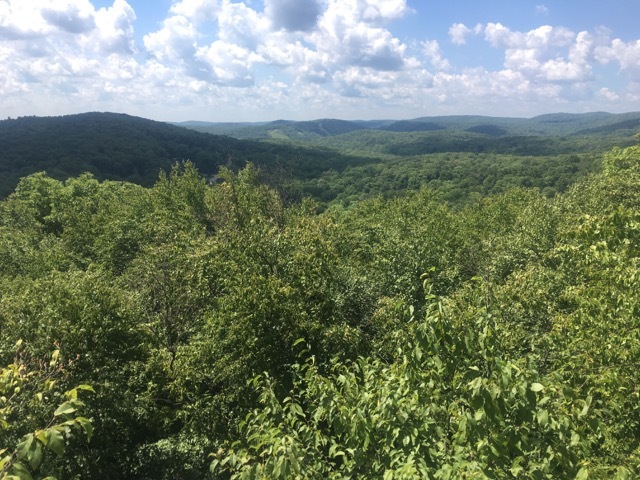 There was a nice view at the top but at this point we just had one thing in mind: get to the bottom, get in the cab, and go have ice cream at Bellvale Creamery. I hurried down ahead to meet the cab driver. On the way I passed the other cache of water and as we ran out a while back, took a big gulp before going out on to the road. I managed to preserve my phone battery and was at about 4% so I was glad she was there waiting already. She was enjoying the day, and a little rest while waiting for us. We thanked her profusely for making sure we connected and got the ride we needed, and told her about the crazy climb on the way back to the creamery. She mentioned the ‘stairway to heaven’ up Wawayanda Mountain just south in New Jersey, but that doesn’t sound so bad compared to what we just did. And suddenly the rebar ladder on the state border seems less intimidating after today. Let’s hope I’m right about that. We got to our car and drove it down to the creamery which sits at the top of Mt. Peter on the ridgeline. Mt. Peter is also a ski resort, and we could see the trails from the top of the legendary cliff on Buchanan Mountain after enduring the crazy climb. I was glad to see the car was still there, and that one more piece of the puzzle came together without issue. I hope this helps me learn to just trust in things working out more. Because everything did fall into place, despite the challenges and all my worries. 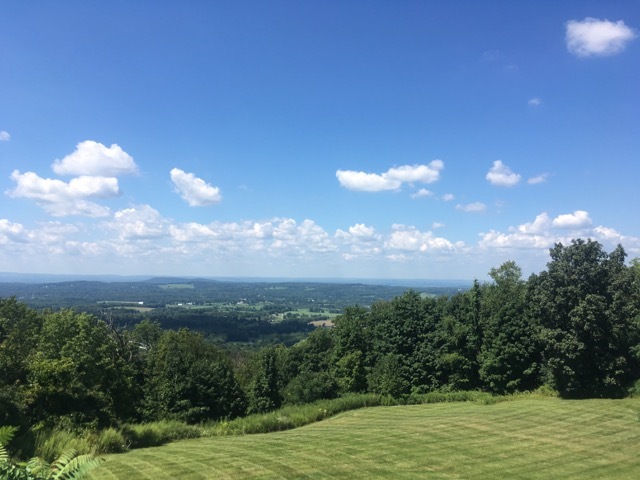 The ice cream tasted great, and I went to get my GoPro to film the amazing pastoral view of the Warwick valley and the Catskills beyond. As I turned around I saw Fielden stream talking to our friend from Mombasha High Point. We made it back in good time, excited for our return in October for Fielden Stream’s birthday weekend and the last New York last section. Usually we end our overnight season in October. But who knows, with how warm the weather has been we might get the chance and urge to do one more. That would probably be in Massachusetts. 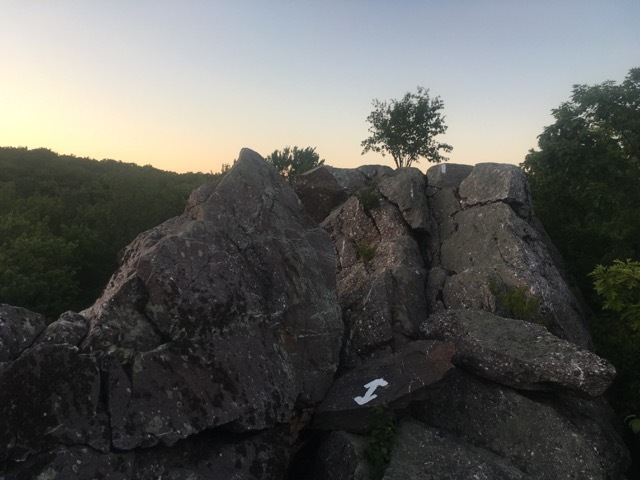 We were going to do that one with the kids, but after this weekend, since the trail has a similar description, we thought it better to start with an easier stretch and not take unnecessary risks. It’s hard enough watching each other go up those crazy scrambles. Watching the kids, while they are probably twice as nimble and able as us, would bring major anxiety and we want to be sure they have fun doing backpacking before taking them mountain climbing! I will be back out volunteering for the next few weekends in Connecticut. Fielden Stream, Jiffy Pop and Ratchet will be out with me too for the second weekend which we will do as an overnight. Maybe we’ll see you!